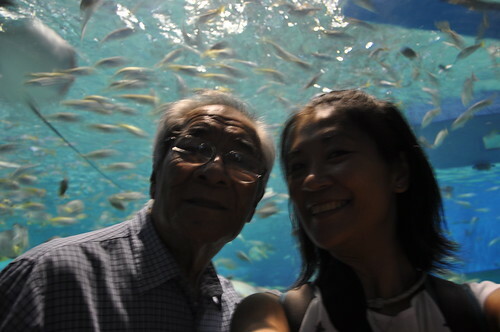 The summer I turned 10, my dad took me on my first airplane ride to Hong Kong, and part of our trip was a visit to the Ocean Park. It was the ultimate theme park in South East Asia at that time. I vaguely remember the whole thing except for riding the cable car and watching the dolphin and whale show. Fast forward some years later, Manila came out with our own version of Ocean Park. Not a theme park person, it never even crossed my mind to go see it, plus I rather be scuba diving with the fishies than see them from the outside. 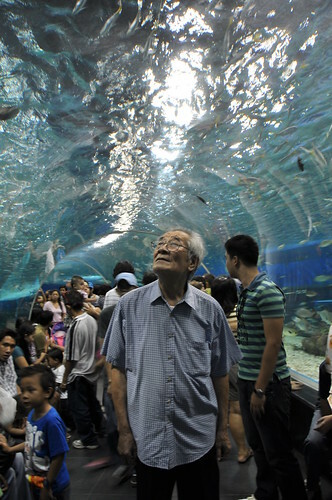 One day my dad said to me, “you know there’s Ocean Park in Manila now“, showing me the advert in the paper. And it seemed natural that I said, “yeah, we should go see it one time.” And so it happened last Sunday. Everyone else at home had other plans, so this day it was just me and my dad. Like before, only this time our role is reversed. 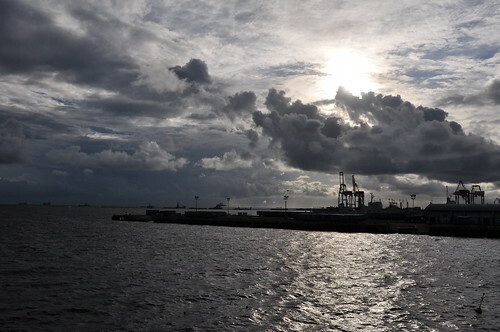 I drove us to the Manila Ocean Park, I bought the tickets, and I took the photos. 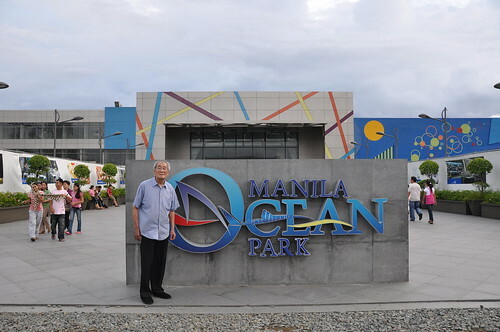 The Manila Ocean Park is located at the reclaimed area behind the Quirino Grandstand in Luneta. It being Sunday, traffic was smooth, except for the short Quiapo stretch. One friend said that it was better than they expected, I came with neither high nor low expectation. The structure from the outside was quite impressive actually. It was modern and huge. I noted that they have ramp for wheelchair and according to the guide posted outside, they have wheelchairs for loan inside. I’m glad my dad doesn’t need it anymore. The interior/lobby area was nice and there were quite a number of visitors that day, mostly family with children. 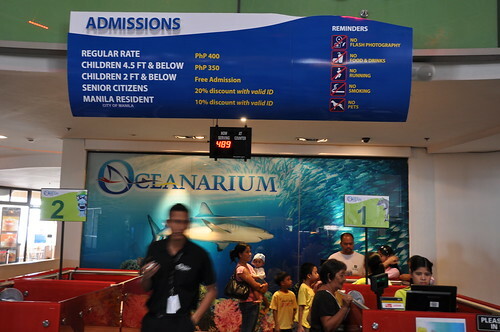 The entrance fee was not very cheap at 400 for adult and 350 for children below 4.5ft. But children below 2ft go in for free. But then of course it is necessary for its maintenance. First you go into a small area of fresh water fishes, then you climb a steep wooden staircase to view the 3 baby crocs, then you climb down the stair and start the salt water fish display. Half the display were fishes we see while diving in Anilao, like cardinal, puffer, porcupine, lion fish, etc. 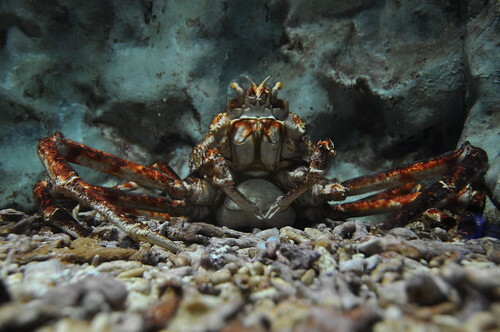 There’s an interesting giant crab from Japan water who can live to a 100 years and can be found 400m below. I wonder how they got him. The most impressive part of this whole setup is the tunnel oceanarium, or the larger than life aquarium where it simulates the underwater world in glass casing. It has a lot of cute mantas and eagle rays, H-U-G-E ones. 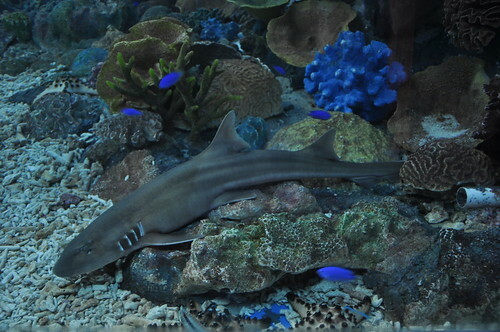 It has a separate one for the sharks, mostly black tip. So yeah, finally I saw live sharks, after all the money spent diving and not seeing any, all it took was 400 pesos and I see over 20 of them. Children scream and run wildly all over the place. They stood on the ledge of the aquarium, crashed into it, and not one of the marshals reprimand them. So it means the structure is sturdier and more secure than any palace or embassy in the world! I reckon it could stand earthquake of any magnitude. If I have to find fault, it will be that it lacks species on display considering that Philippines is in the center of world’s marine biodiversity. It has too much of the same species. I wonder where they got the mantas. It’s no surprise we only saw 1 in Ticao last year. I wanted to see giant jellyfish. No octopus where there are various sightings in Puerto Galera. And why do they use whale shark in their tarpaulin when they don’t have it in there? BUT over all it is a good experience and I recommend locals go check it out. The children will definitely enjoy it! The building also have rows of restaurant and shops. They also have an area that can serve as function room. So you can have an under water themed wedding surrounded by huge grouper and zapping mantas. I think there was a wedding reception that day. We finished our tour at 5pm and ate at the buffet operated by Tamayo’s Catering. It costs P590 net per pax. We did so I can take photo of the sunset, except this is the wrong side of the bay, so no sunset, pfft. 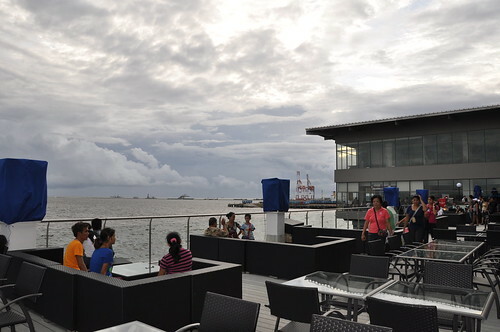 There’s a nice outdoor hang out place that I like (see photo). If only you can sip champagne and watch the sunset here. We visited Manila Ocean Park yesterday. It was really fun! Two thumbs up!!! I just breezed through your pictures. Nice! nice day for a father-daughter bonding…against the backdrop of an unforgettable childhood memory..
Wow, I really liked how you started the entry with a story from your childhood (with pictures!!!) and then fast forwarded to today with your father once again. That’s just really special. It’d be nice to do some of those things we once did as a child with our parents, but to switch roles so to speak. My point being, if you’re going to do it anyway, do it the grand way! hello li! 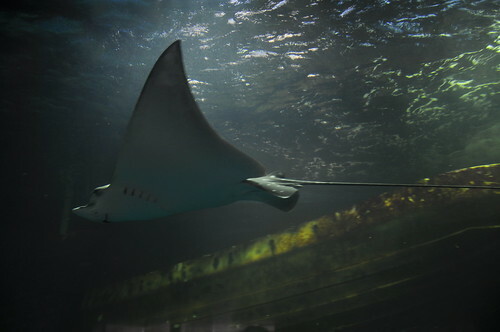 it is so nice that you posted about manila ocean park this way, very nostalgic! :D nice shots by the way! Thanks, Tin… :) Did u finally take the kids to visit?